We live in a great little neighborhood with amazing neighbors. We are also very fortunate that our next door neighbors have a son that is only a couple months older than Noah. His name is Gus. 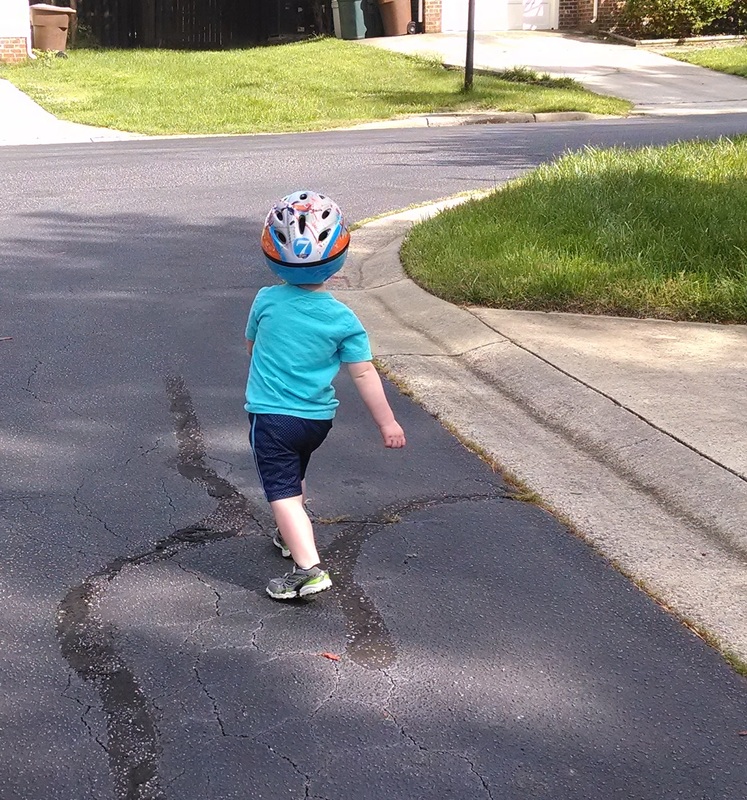 Well, a few weeks ago, while the boys were playing and riding bikes in the neighborhood cul-de-sac, Gus was wearing a Lightning McQueen helmet handed down to him from his big brother. 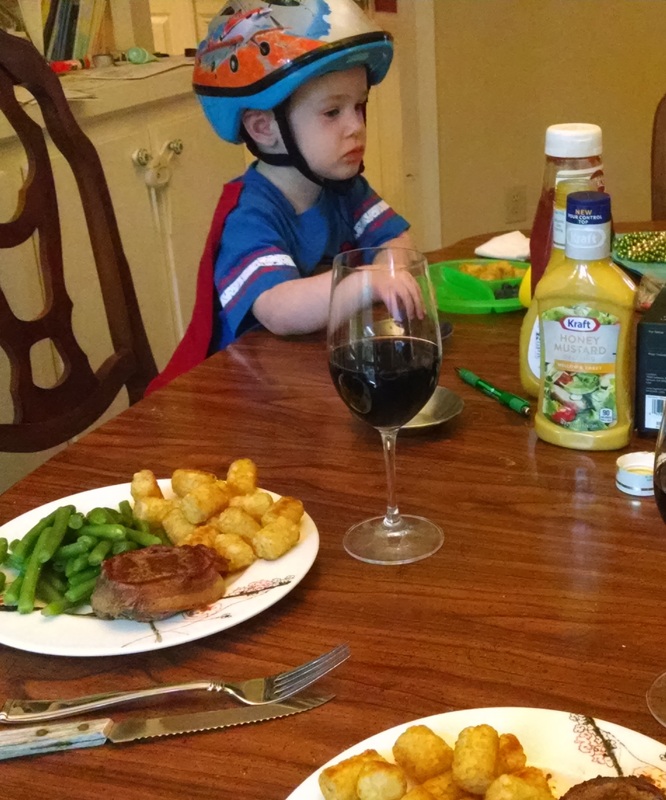 He looked super cute and, of course, Noah just had to have a helmet too. Noah had to have a hat (which is obviously second place to a Lightning McQueen helmet). We run all the way back to the house, search for his hat, panic a little when we can’t find it, Matt finds it, and I run back out to give Noah the hat. Well, by this time, Gus is tired of wearing the helmet. 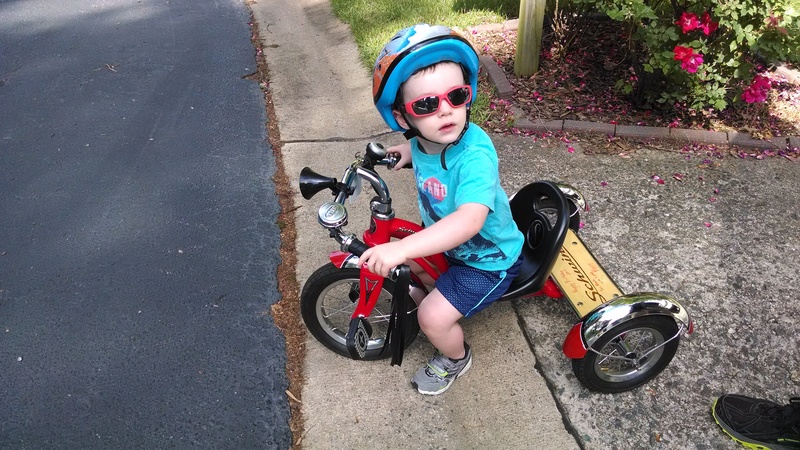 He takes it off, sets it on the ground next to his juice box, and continues riding his bike. At this point, there is no sharing, no learning opportunity to be had, no calming Noah down as tears are flowing and wails can be heard 3 blocks away. Gus doesn’t want to wear the helmet but he sure as heck doesn’t want Noah to wear it either. Matt takes Noah inside, kicking and screaming, and I am left to gather Noah’s toys and head home. And, this brings us to this past weekend- the weekend of the helmet. Saturday morning, my wonderful husband decides that, in order to prevent another “helmet incident” that we should go and buy Noah his own helmet. We needed some other things at Target so, why not?! Let’s go get the kid his very own helmet. We stroll into the store, buy the random odds and ends that were on my list, and head over to the sporting goods area. Noah picks out a helmet with Dusty the crop-duster on it. Everyone is very excited. We also just absolutely had to have a new Superman T-shirt with a cape and mommy was tired so she caved. After paying for everything, the moment I put my wallet back into my purse, Noah demanded that he put on the Superman cape right away. So, as mentioned before, mommy was tired. I pulled Noah’s dinosaur shirt off, ripped the tags off of the Superman shirt, and put it on him. Now he was excited! 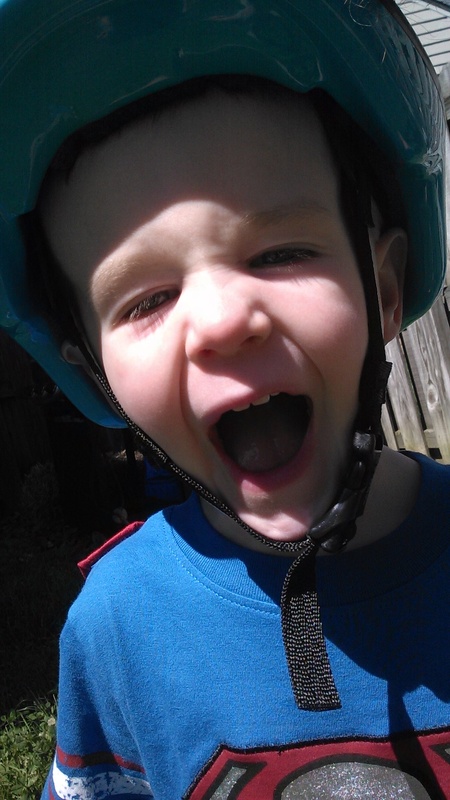 We ran a couple other errands while he insisted the entire time that I get the helmet out so he could wear it. The tags and wrapping of the helmet required a little more effort than the t-shirt so he had to wait until we got home. So, we venture outside to work in the yard. 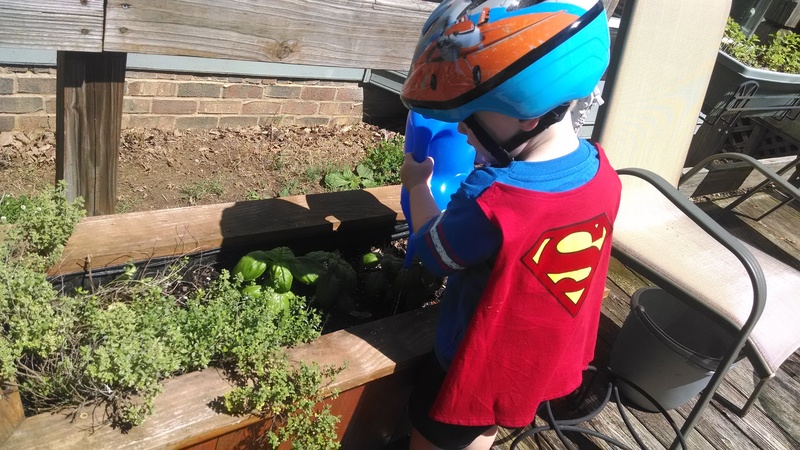 Noah helps me water my plants. 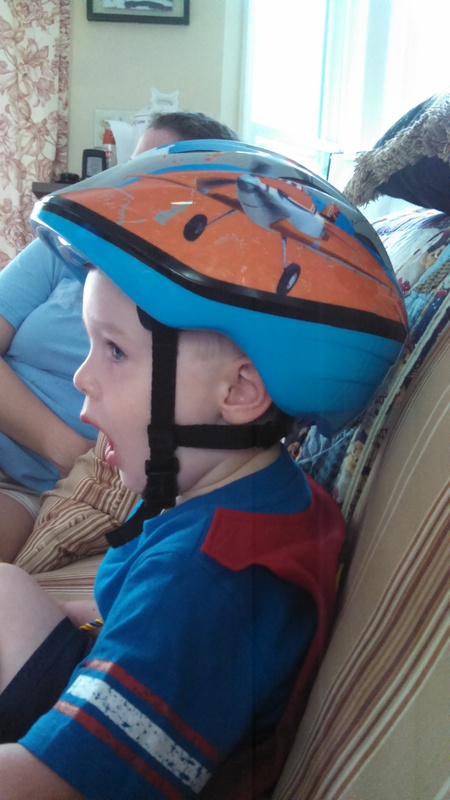 Before his nap, I convince him that little boys are not allowed to wear helmets to bed. But he had to sleep with it in his room. After his nap, it was a little too hot to go outside right away so we finally watched Frozen for the first time. The next day, we actually wore the helmet to ride our bike. This time, we also needed our Dusty sunglasses. We got tired of riding our bike. 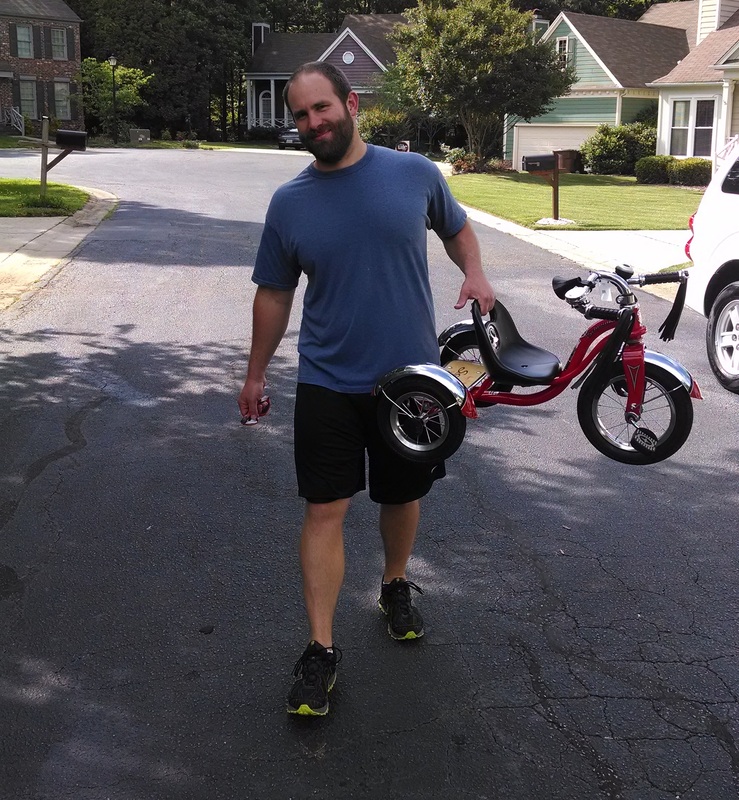 So Daddy had to carry the bike home. That evening, I hid the helmet.